With the news that ITV are bringing back World of Sport for a one off special, there's never been a better time to get into British wrestling. 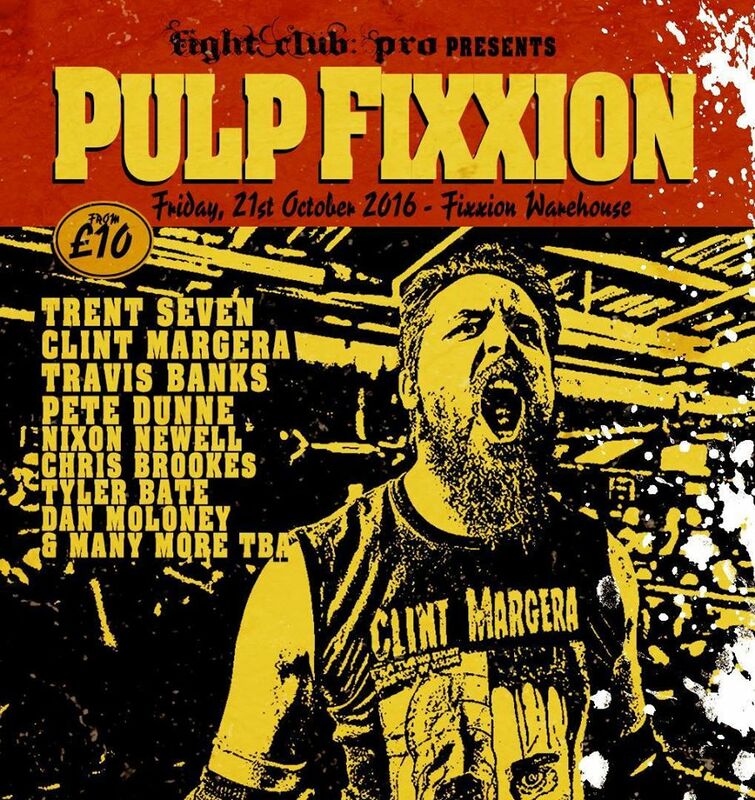 This weekend, we begin our look with Fight Club: Pro in Wolverhampton as they present Pulp Fixxion, before moving down south to Selson in Surrey for IPW:UK UK Future 8 2016 and then flying back up to Glasgow, Scotland for ICW as they celebrate their 10th anniversary with a special taping of Fight Club. There's little time to wait so let's get Ready For The Weekend. There's also alternative shows in Edinburgh, Swindon, Stroud, Wolverhampton, Kent and Bristol, so there's no excuse not to get down to a show! On Friday night, Fight Club: Pro kick-off a triple header at Fixxion Warehouse in Wolverhampton with Pulp Fixxion. It promises to be another night chock-full of British Strong-Style, with an added twist as a number of CHIKARA performers join in the fun as well. Having won the FCP Championship from Sami Callihan at Project Mayhem V in September, Pete Dunne finds himself teaming with a man making his debut for the company. But this is certainly no rookie taking his first steps in pro wrestling as Dunne teams with veteran and former ICW World Heavyweight Champion Mikey Whiplash. On the other side of the ring will be the man that Dunne and Callihan attacked in September, Trent Seven. With Seven scheduled for a singles match with Dunne on Saturday, both men will be looking to cause as much damage to the other as they possibly can and head into Saturday's clash with the upperhand. Joining Seven will be Clint Margera who is coming out of a brutal feud with Chris Brookes and will be looking for a new face to inflict his own brand of lunacy on. He'll find himself up against Whiplash on Saturday. With four men who are known to like to get more than a little bit violent, this contest could end up going all over the Warehouse, but when the dust settles the title picture in FCP could have a very different look. Travis Banks has been one of the most consistent performers in FCP in 2016, but perhaps not in the way that he would have liked. Despite coming close on numerous occassions, against the likes of Zack Sabre Jr, Sami Callihan and Trent Seven, Banks is yet to collect a victory in FCP. That brings us to this Friday where he'll come against the debuting, "Iron Man" Joe Coffey. A former ICW World Heavyweight Champion, Coffey has wrestled some of the best performers in the World, and similar to Whiplash despite making his debut in FCP, he'll be anything but a pushover. Banks desperation for a victory may push him even further against Coffey and force him to take a step up. He'll be looking to move faster, hit harder and dig deep. If there's anyone that can match those attributes it's Coffey, who will be looking to make an impact on the fans in Wolverhampton. In an event that is choc-full of debuts, Kay Lee Ray will step into an FCP ring for the first time as she takes on Nixon Newell and Kimber Lee in a mouth-watering triple threat bout. Newell will be looking to bounce back from her loss to Jessika Havok in September, whilst Lee will be looking to recreate the form she was on during FCP's CHIKARA tour in May, that included a victory over Newell, while KLR will be wanting to show the FCP crowd what they've been missing out on. When the discussion turns to the best females in independent wrestling these three names are almost guaranteed to be brought up, so what happens when you put all three in the ring at the same time? Fixxion Warehouse will find out on Friday night! Also on the card, Chris Brookes faces two time CZW Wired Champion Shane Strickland, whilst Dan Moloney comes up against former CHIKARA Campeonatos de Parejas Champion Fire Ant. 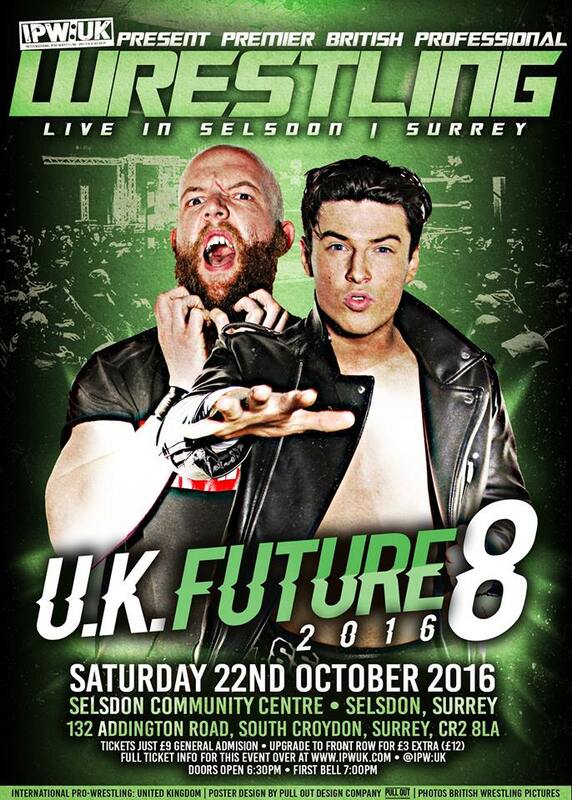 Moving on to Saturday and IPW:UK are holding their annual 'UK Future 8 2016' in Selsdon, Surrey at the Selsdon Hall. The event sees eight up and coming stars competing in four quarter-final matches with winner progressing to semi-finals and the eventual final, all in one show. This year sees last year's winner, Sammy Smooth back to make it two straight years as UK Future 8 winner. However, this year he will be holding the All-England Championship which he shall be defending in not only his quarter-final match but if successful, every round of the UK Future 8 tournament that he competes in. Sammy Smooth will be facing Cieran Donnelly whose tag team partner, Danny Duggan will also part of the tournament and will be competing against Scott Star in the second quarter-final match. The third quarter-final contest will see the debut of Robbie X in IPW:UK and he'll be facing IPW:UK training school graduate, Ashmore in what will be a big match for both men. The fourth quarter-final sees another IPW:UK training school graduate, Lewis “Maverick” Mayhew in action when he competes against one half of the current IPW:UK Tag Team Champions; Scott Wainwright. Mayhew has a big future ahead of him but it could well be cut short by Wainwright. While it is very hard to pick a winner in these types of tournaments, a few stand outs in the pack are Robbie X, Sammy Smooth and Scott Wainwright. Robbie X has the advantage of not only being a debut in IPW:UK but holds a vast amount of experience. Possibly the most experienced of all eight men. Sammy Smooth on the other hand has the experience of winning this tournament before and that is sure to give him an edge. The added pressure of having the All-England Championship on the line could either be of benefit to him or be the cause of his downfall. Scott Wainwright is probably in the most successful era of his career so far and that is largely down to his change in attitude much to the detriment of his opponents. 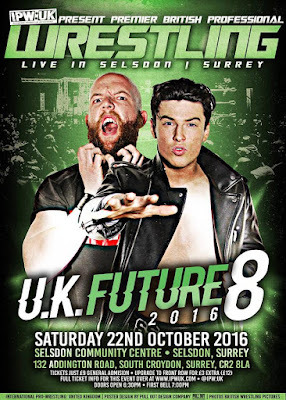 A more ruthless streak has already lead him to becoming the IPW:UK Tag Team Champions with Paul Robinson and that streak could well lead him the becoming the UK Future 8 winner of 2016. Also scheduled for this Saturday is the first ever 10,000 peso tag team challenge where Cuban Heat and his new banker, Marc Lloyd shall face Muscle Mountain. Finally on Sunday, Insane Championship Wrestling will celebrate their 10 year anniversary with another edition of their 'Fight Club' event in Glasgow at The Garage. 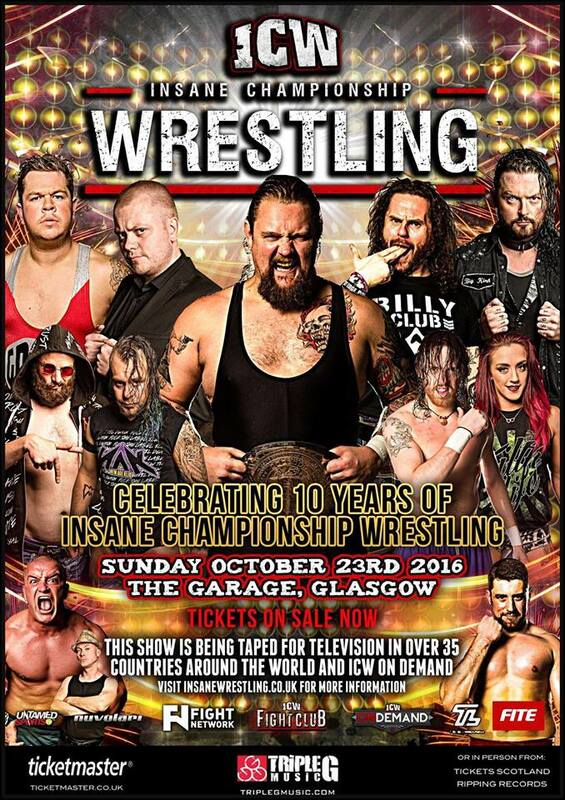 The event will have a number of implications for 'Fear & Loathing IX', ICW's biggest show to date. One match that will shape 'Fear & Loathing IX' is the contest between Kenny Williams and Lewis Girvan. When it was announced that Ricochet would be in action on November 20th, both men threw their hat into the ring to face him. ICW management decided that instead of them choosing who would face Ricochet, they would let them fight it out to see who wants it most. So that's what's going to happen this Sunday, former ICW Zero-G Champion; Williams who has been fighting with Lionheart for a number of months will face Girvan, the self-proclaimed “Best Young Wrestler In The World”. Only one of them is face Ricochet at 'Fear & Loathing IX'. ICW have also announced that BT Gunn and Stevie Boy will end their rivalry at 'Fear & Loathing IX' but in what type of match that will be is to be decided by the winner of Chris Renfrew & Gunn vs The Filthy Generation on October 23rd. Gunn and Boy were supposed to face each other at the last edition of 'Fight Club' but that never happened thanks to a chairshot from Kay Lee Ray to Gunn. If it had not been for Renfrew's intervention, the outcome could have been far worse. Both Gunn and Boy hate each other with a passion. Their previous matches show that to be clear. Whoever wins the match this Sunday will have something very special in store for their final encounter. Lionheart is defending the ICW Zero-G Championship in a Stairway To Heaven match on November 20th and there have been a number of qualifying matches for the five match places that are available. This Sunday will see another qualifier take place with Liam Thomson taking on Chris Ridgeway. Thomson has been a stalwart of ICW for a number of years and is back in the hunt for championship gold after shall wee say an unsuccessful attempt to woo Debbie Sharpe. Ridgeway has declared his intentions to be in the Stairway To Heaven match and wants his first taste of gold in ICW at their biggest event to date. Both men are hungry for a win this Sunday so they can go on and be in with a chance on November 20th. One element which may come into play is that fact that Thomson never answered Christopher Saynt's challenge on two occassions. Saynt has announced that he will be attendance this Sunday. Take that as you will. Also scheduled this Sunday is six-man tag team action between Mike Bird, Wild Boar & Iestyn Rees of The Mauraders and the trio of DCT, Sha Samuels and Grado. Additionally, Darkside, William Grange and Dickie Divers will compete in a three-way elimination match while former tag team partners, Davey Blaze and Joe Hendry will meet to settle their differences in the squared circle. While Mark Coffey has been suspended by ICW co-owner, Red Lightning, his tag team partner and fellow ICW Tag Team Champion; Jackie Polo will be facing Red Lightning's cousin, Aaron Echo in singles competition.